Renting in Houston: What will $1,200 get you? We've rounded up the latest rental listings via rental site Zumper to get a sense of what to expect when it comes to scoring a place in Houston if you've got a budget of $1,200/month. 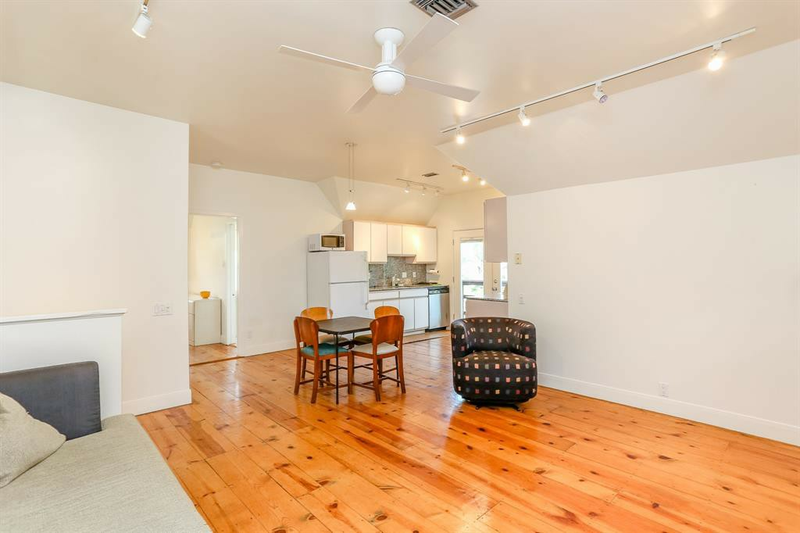 Listed at $1,200/month, this 700-square-foot one-bedroom, one-bathroom spot is located at 1405 Allston St. When it comes to building amenities, expect garage parking, outdoor space and a swimming pool. The furnished apartment offers air conditioning, a balcony, hardwood flooring, wooden cabinetry, stainless steel appliances and a dishwasher. Canine companions are welcome. There's no leasing fee required for this rental. Per Walk Score ratings, this location is very walkable, is quite bikeable and has some transit options. Next, there's this one-bedroom, one-bathroom apartment situated at 1111 Brittmoore Road. It's also listed for $1,200/month for its 700 square feet of space. When it comes to building amenities, anticipate on-site laundry, garage parking, outdoor space, a swimming pool, a fitness center, a roof deck, an elevator, storage space, secured entry and on-site management. In the unit, there are hardwood flooring, air conditioning, a balcony, a ceiling fan, a dishwasher, high ceilings, in-unit laundry and a walk-in closet. Both cats and dogs are welcome. According to Walk Score's assessment, this location requires a car for most errands, has some bike infrastructure and has some transit options. Here's a 700-square-foot one-bedroom, one-bathroom apartment at 2200 Taylor St. that's going for $1,200/month. In the unit, you'll get hardwood floors, high ceilings, a dishwasher, in-unit laundry, a walk-in closet, a balcony, air conditioning, wooden cabinetry and stainless steel appliances. The building features on-site laundry, garage parking, outdoor space, a swimming pool, a fitness center, a roof deck, an elevator, storage space, secured entry and on-site management. Pet owners, take heed: cats and dogs are welcome. According to Walk Score, this location is quite walkable, is bikeable and has some transit options. Next, check out this 700-square-foot one-bedroom, one-bathroom apartment that's located at 6099 Washington Ave.. It's listed for $1,200/month. In the unit, you'll find hardwood floors, high ceilings, a dishwasher, in-unit laundry, a walk-in closet, a balcony, air conditioning, a ceiling fan, wooden cabinetry and a breakfast bar. The building boasts on-site laundry, garage parking, outdoor space, a swimming pool, a fitness center, a roof deck, an elevator, storage space, secured entry and on-site management. Luckily for pet owners, both dogs and cats are welcome. The listing specifies a broker's fee equal to one month's rent. Walk Score indicates that this location is very walkable, is bikeable and has a few nearby public transportation options. Finally, located at 11070 Katy Freeway, #1365, here's a one-bedroom, one-bathroom apartment that's listed for $1,200/month. In the apartment, expect air conditioning, hardwood flooring, wooden cabinetry, stainless steel appliances, a dishwasher, a breakfast bar, high ceilings and a balcony. The building provides a swimming pool, a fitness center and assigned parking.Pets are not allowed. Future tenants needn't worry about a leasing fee. Walk Score indicates that the area around this address is car-dependent, is bikeable and has a few nearby public transportation options.